Direct Energie have applied to the UCI for a World Tour licence for next year. The team has been in the World Tour before when it was sponsored by Europcar and its current sponsor has just been bought by French oil major Total meaning it’s theoretically got a line of funding that could make Team Sky feel jealous. Just one problem though: there’s no World Tour licence to spare. Direct Energie has been successful at what it does, a French Pro Conti team, it’s hard the right blend of promise and results to justify invitations to the Tour de France, Lilian Calmejane won a stage last year and if this year’s Tour was blank, they still tried and would regularly flood the day’s breakaway, the kind of animation that invitees are expected to deliver. At the same time, as a Pro Conti squad they’ve not had all the costs a World Tour team faces. The licence itself isn’t that expensive, the UCI fee is about €80,000 compared to €20,000 for a Pro Conti one, instead it’s having to race three grand tours a year while also competing on other fronts simultaneously, for example sending eight riders and support staff to the Giro but also having a team do the Tour of California while also having riders getting read for the Dauphiné and Tour de France. All of this requires a deep roster and more support staff as well as vehicles. There’s been no need for this, Direct Energie is a French alternative energy provider so there’s been close to no commercial imperative to race the Giro or Guanxi; in Belgium the company has a brand called Poweo and the team races with the Poweo logo there but that’s about as international as they’ve wanted. In short they’ve been a Pro Conti team with an almost guaranteed golden ticket to start the Tour de France. So the application for a World Tour licence for 2019 is curious. The press release announcing the plan pointed to how they were on the attack a lot in the Tour and good on them for trying but it didn’t set out much more reasoning why they should move up. The sponsor Direct Energie and the boss Xavier Caïtucoli says he’s pleased with the team and wants things to move up. Yes Total has taken over the firm but there’s not a whisper of the presence of the multinational and if the new owners were to have plans to ramp up spending on cycling it’s unlikely they’d have hatched them less than a month after the takeover so for now Total hasn’t mentioned anything. This says that in the event of World Tour team stopping the licence isn’t there for another team anyway, the number of teams will shrink. So these two rules say no existing team can be relegated and should any squad have financial or ethical problems their licence won’t go to anyone else anyway. So why the application? It’s an odd move, does Jean-René Bernaudeau know something about other teams that we don’t? It is a PR move to say “look we think we belong with the big teams” in the wake of a Tour de France when they showed plenty but struggled to deliver? If so the risk is one of the UCI saying “sorry, you don’t” in the coming months. That said the pro conti ranks are an odd place at times, just look at the deal between Aqua Blue and Verandas Willems that was announced by the Irish team yesterday only for the other team to say “hang on” and the announcement to vanish. Also the UCI has finessed things in the past, inviting the likes of IAM Cycling to join the World Tour in order to ensure the top tier actually had the right number of riders but that was a fix and this time nothing seems broken. One theoretical path is a World Tour team asks to be relegated and since this isn’t “dissolution or termination” from the team then potentially the licence could be given to someone else but why would a team surrender a UCI World Tour licence and the advantages that come with it? Why apply? It’s not clear, it could be the sports admin version of going in the early breakaway during the opening week of the Tour de France: to get noticed before being reeled in later on. It’s ambitious but it’s hard to see how Direct Energie get a spot in the World Tour next year unless they know something that isn’t in the public domain. Either way it’s useful example to explore the current World Tour licence situation because no teams are worried about losing their spot at the moment, there’s no frantic dash to recruit riders for their points at the moment. The UCI announced plans to shrink down from 18 teams to 16 back in 2016, these have seen been delayed by a year but if these plans continue then there could be worry ahead for the teams for 2020. But that will only make it harder for a Pro Conti team to move up. As you suggest perhaps they know something being that the UCI president is French. Perhaps they are gambling that a potential salary cap, team size reduction or other potential rules will shake things up. At least they are at the front of the line, against other Pro-Conti teams that say they want to move up as well – Israel Cycling Academy, Rally Cycling, Aqua Blue….. It seems the French circuit of UCI races along with WT races would require a large team – even if they skip the non-required races like Tour of California. The stunt, however, might make it easier for some riders to sign on – given the “perceived” potential of being WT in the future. Pierre Rolland is rumored but also wants to stay in WT, perhaps he should read your great blog to get a reality check. Even then I think it helps at the margin on signing some newer recruits. But if 2020 becomes the year of WT read allocation, does it make sense to keep powder dry until next year, and signal intent right now? All these “something must be done, X is something, let’s do X” suggestions following the Tour, even from Lappartient, could happen but probably won’t and if they did it would take years to implement, so unlikely to see them suddenly happen during the licence application process. It’s X, Y and Z that should be tried. And much more. It is common sense and opinion that there is little lose by shaking the regulations in order to curb teamwork dominance and a lot to gain. “even from Lappartient” – that’s funny. He’s a typical politician who will spout any old nonsense that he thinks will play with the public. He thinks he knows the right buttons to push with cycling ‘fans’. Fans like Antoine Vayer. You’re giving Lappartient far too easy a ride on this blog. Ideational populism seems to be rife at the UCI now, not just in domestic politics – it seems it’s all the rage. Let’s hope fashion changes before too much damage is done. I don’t read „shall be assumed to have met the sporting criteria“ as „getting a licence“. It just means, that they don’t have to scramble for points. But if there are other teams without world tour licences, that also meet all criteria, there has to be made a choice between them? So maybe we get one team more next year. But of course I don’t know, if somewhere else in the uci rules, there is a rule that says for example „all teams having a licence in 2016 will have a licence till 2019“. Unfortunately under the last uci president, whose name I happily have forgotten (the day and way he lost was a very, very good day), we got stuck into this horrible american style closed league system. At least it soon is over. Can‘t wait for the reforms of the world tour, especially making the world tour much, much smaller. Right now we have quite a few teams in the world tour, that don‘t belong there. They are indeed pro conti teams. And we have a lot of pro conti teams, that are not pro conti and belong in the conti ranks. Which also means, that sponsors pay too much money for a world tour team, that in truth is a pro conti team, just because they got that damn licence. All this is the result of a bloated, messed up world tour. And let’s not forget, that it were the teams, that demanded and lobbied, that they wanted the pro tour/world tour and all their wishes were granted (I still remember the list of demands they got out in 2000 and all these „wishes“ on that list were followed through, what we have now is what the teams wanted) and it exactly brought us nowhere. Ok, that is not totally right, it brought us to a bad place with teams like sky, astana, tinkoff, bahrein merida, katusha (before alpecin came on board) and uae. Much better for the sport, if teams can compete on equal footing and have something to fight for. That was, why I was so shocked, when that last uci president, who managed to do quite some damage in just one tenure, began to even pump up the world tour more and more and seemed to purposefully try to destroy cycling with making the racing even more loopsided and removed from something real. Today we have three quarters of the peloton in a race being totally uninterested in the race. They know they have no chance, but they have to ride, so they ride. But riding is not racing. And this „riding“ changes the racing. And it also changes the racing in another way, as was visible in the Tour, as sprinters were missing the usual Tour preparation races for commercial reasons in other races and had to quit the Tour. It is high time, that cycling becomes again a sport. How is it over? Surely it’s just as much a closed league as it has been, just slightly smaller? – driven by one or more riders Direct Energie would like to retain (Calmejane…) but who are looking for WT status and broader racing? – driven by Direct Energie who have increased massively turnover and visibility and who, independently of Total, wish to invest in line with thier results? This is pro cycling.. the rules can be bent, broken or changed. Yup, that’s what I was thinking while reading this. I couldn’t stop thinking about the situation Dimension Data were in a couple of years ago where it was plainly there in black and white that they’re going to be off the World Tour. But rules were changed at the last possible moment to let them in. I’m betting that if they apply and if a team does drop out, Direct Energie would get that slot and that the number of teams in fact wouldn’t drop down. And the rules had already been changed at the next-to-last minute to leave them in danger of getting booted. Yes, especially when there’s money to be put in the UCI coffers. Now they actually have teams fighting to get into WT instead of 16 teams fighting over 17 places and the like. What’s not to like? As long as a team can pay the admission fee and whip up some documentation that meets the UCI regs, why not? As you say, they’ve bent, broken or changed rules for lesser things over the years. And it’s a French team! Really interesting read even if it doesn’t shed light on why – thanks, as always, IR. Maybe they know BMC is folding or Mitchelton can’t get the sponsorship money and want to be first in the queue if there is a licence going spare? Or maybe part of Total’s takeover terms were to pump in the money to sustain a WT team (yes, I know, that’s far fetched). What about BMC? If their funding isn’t secured then perhaps a spot comes available. I know that Inrng has sort of nixed that by stating that the number of teams will fall, but that narrative seems somehow likely. But the license for Direct Energie still seems unlikely. CCC already got BCM licence and they are either going to be the new sponsor or both teams will merge, we are still no sure, but the team is saved. The team’s announced it’s safe, up to the new owner to put up the money and more now. As we keep seeing their losing a lot of riders, just yesterday Teuns and Bettiol were announced at new teams. At least the team’s previous sponsor, Europcar, is a global brand, so while the team remained French, the sponsor could at least get something by showing the colours in Australia or North America. By the same token FDJ and AG2R don’t have sponsors that are global brands but I understand the prestige of riding in the World Tour. So with two top tier French teams and a clear path to the World Tour for top French riders there doesn’t seem to be room nor a reason for Direct Energie making the climb up to the top step. Unless Total has a plan to make Direct Energie a global brand, of course. Or simply to rebrand the team as Team Total. Wasn’t Europcar the team actually sponsored by a French regional wing/franchise (Vendée? ), rather than corporate multi national Europcar? So the wider brand benefited from promotion paid for by a local branch? No, it was the French HQ, which is the worldwide business. Some people saw the Vendée logo on the jersey too as the region sponsors the team today as it did then and also backs their development team Vendée-U. Do we know if the team will continue to ride next year under the Direct Energie branding? Total are certainly a major French company so their presence must surely be welcomed. It will be interesting to see how far their involvement and ambition reaches as, potentially, they do have the financial means to become one of the major cycling teams. It all seems too soon, Total have only just bought the company and besides if they had big plans they’d make a splash by announcing them. Are these “no relegation” rules the reason for a quiet August 1 this year? Normally there are a series of announcements about now as various teams confirm (or torped0) the various transfer rumours that have been circulating for weeks. Or is it that this year most of the big names are on contracts that take them into next year? Voeckler isn’t the team GM is he? That would probably explain it. How sure is their wild card for the Tour in the next years? Direct Energy was not invited for the Criterium Dauphinée this year. Three wild cards went to french teams in the last years, but there are 5 french Pro Continental teams. Chavanel retires, who was a guarantee for their participation this year. Next year they compete with Fortuneo (Barguil), Vital Concept (Coquard and perhaps Bouhanni )and Cofidis, who are always invited. Yes, I really wonder if it has more to do with ASO’s wild card invite process. Maybe more competition as you have suggested among French teams. But I also wonder if ASO may be thinking of being more systematic and transparent in their wild card selection process for which they received criticism for. Though that criticism probably isn’t new, and it’s doubtful that ASO would bend and deviate from what they’ve regularly done. So, it seems to make the most sense that the Direct Energy team management don’t see their invites to be as secure as they have in the past. BMC without Van Garderen? I need to have a sit down. All success to French teams, wish them the best. I really like that photo. The cynic might say it captures ‘the essence’ of Total a bit too well though. Real problem when big money cannot come into our sport. First Alonso (F1) now Total. Maybe more teams with fewer riders is the way to go. I find that UCI application processes seem to overly complicated. What i have read pf president lappa in general have appeared off point(in particular his ongoing froom should not race rant) But i will give him credit for his proposal of a rolling wt rank(think tennis). Imagine top18 by dec31st get fdf invite etc. That might be somewhat skewed towards upper tiers since more points to be gained in wt(big teams gets phatter) yet the point with clear sporting criteria makes sense. This beautifull sport derserves a better sporting system. French team, a French UCI president who hates SKY as much if not more than Larry. Conversations have taken place. Teams will not have financial caps placed on them and number of riders for GTs remains unaltered. The UCI licence process is thankfully very independent. People will remember how Brian Cookson wanted to ban Astana but the UCI licence commission asked on what grounds he wanted to apply this collective punishment and told him it couldn’t happen. Sorry Larry, I knew you might rise to the bait ! I understand, but think those who take a political/personal stance on team sponsors and individuals should be more balanced in their view. The possibility of additional financial investment in pro bike riding should be welcomed by everybody. Without sponsorship there would be no wheels turning. It’s no good moaning and complaining about the dominance of one team with the financial clout, management and riders to succeed, and then having a structure with rules and regulations that prohibit the potential competition from competing on a level playing field. The current situation simply illustrates yet again the shortcoming of the World Tour model. Another team beating SKY at the Tour would surely be far more satisfying than losing an excellent long term sponsor which will simply depress rider wages – at best. If indeed there is significant investment available, and it’s a big if, I am sure that money will make the wheels of business sense turn. Despite rather than because of UCI rules and regulations. I also wonder if the WT costs weren’t so insane the sport could do without the likes of SKY, Bahrain, UAE and Astana’s rather tainted sponsorship funds? BC – I agree, cycling is not a sport that would be wise to impose a salary cap. Let’s be honest, if Team Sky was not going to dominate the sport, they would pull their sponsor. They’re not doing this for the love of the sport or to keep a level playing field. They purely want their name on the winning rider of the biggest race on the planet. If Brailsford could not promise them that, then their money would dry up. As it is, I wouldn’t be surprised if their money disappeared in the near future – I really don’t see an American company seeing good long term value in a top-level European dominated sponsorship deal. It seems you answer a question before you ask it? I got curious: since the additional burden of being a WT team is indeed heavy, it should have been an attractive option for a certain kind of team to voluntarily drop down a level, i.e. to surrender their licence – but I couldn’t find a single such case in the years 2009-2017! This must mean that the Inner Ring is indeed right to ask the question: the advantages of holding a WT licence must be greater than the burden, provided you have the budget and you are able carry that burden – but if you don’t have that budget, it is almost invariably the case that youŕ main sponsor has decided to withdraw altogether and you don’t have the budget for a Pro Conti season either and you are therefore unable to “drop down a level”, no matter how attractive that option might be. The lack of historical precedents (other than Team Europcar, even if that was probably more of an involuntary than voluntary decision) doesn’t mean that one of the current WT teams might take such a decision in the future, but I don’t think it will happen at any time now. Indeed it seems to me that the room for teams that “will still get invites” is becoming more and more narrow and that the advantages of holding a UCI WT licence are getting bigger and bigger. Maybe the managers of Direct Energie have seen the future more clearly than we have? Maybe applying for a WT licence for 2019 is a smart move and will put the team ahead of the other Pro Conti teams when the wild card teams for the grand tours and the big races in 2019 are chosen? But the teams created this scenario in the most part themselves. They wanted a guaranteed entrance to the most important races aka the Tour de France. That was their core demand and that was why the pro tour/world tour was created. And with this idea they doomed themselves to a vicious cycle: They have to stay in the world tour, because only then will they be in the Tour de France for sure. And that race is the only reason most real sponsors are in the sport. They don‘t care about the other races. A win in other races is nice, but no reason to have a world class cycling team. But to be in the world tour teams now have to have always more and more money to stem all the other races they have to field riders in. And so they clogged up the whole sport with this – to me- absolute stupid idea of a closed circuit without competition. It became more important to have that licence than to ride races. The second league aka smaller teams ceeased to be competitive, because the world tour sucked the life out of them. Teams, that would have thrived in a smaller race are doomed to be faceless in big races, just because of that licence. It is a bit like a dog chasing it’s own tail. The teams often have to me the feeling of addicts, only living for the next shot of sponsor money, making bad decisions and then blaming others for that. The truth is, that the sport simply is not as big as it thinks it is. 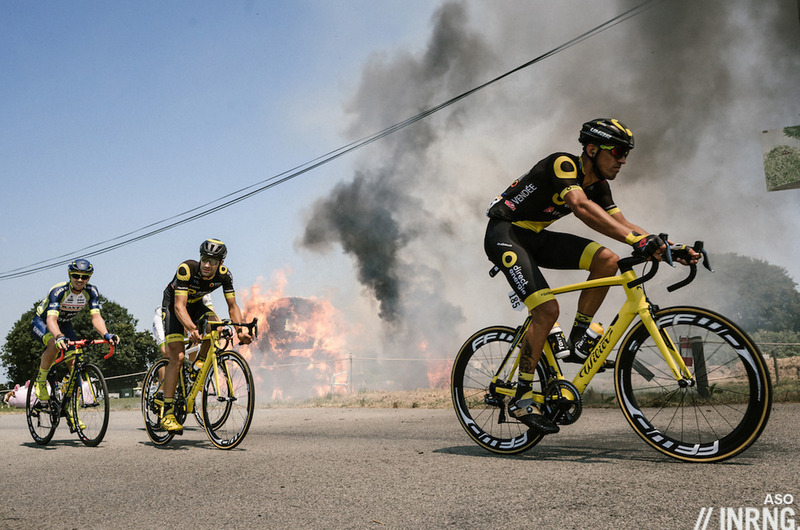 The Tour de France gives the cycling people the idea they can dream big, but they prefer not to see, that this is only one event and that they have to model their team to be sustainable for all the other days, when the Tour is not on. The Tour de France could easily exist without professional cycling, the majority of the people watching it have no idea, who races there, for example, nobody at my workplace knows who froome or sagan are, they never heard that names, but they know the Tour de France and the most watch a few stages each year and read newsreports about the race. They see riders suffering, a lot of people cheering, a nice environment and all is great to them. The Tour is the only professional cycling they ever get in contact with (and that although we have a WT race in town). When I say, I like cycling, all say: Oh, me too, the Tour de France! That is cycling to them. So the Tour can easily exist without professional cycling, but professional cycling can not exist without the Tour de France. There simply is no natural demand for employing 500 men for hundreds of thousands or millions of Euros to pedal up and down the streets the whole year. Cycling isn‘t alone with being a small sport, it isn‘t different for handball, volleyball, surfing and hundreds of other sports. Tennis would be nowhere without the Grand Slams, betting and banks, when you watch a normal tournament the most matches have 10-15 people watching it. I feel always sad for the players. Just because a handful of sports exist, that make money (often in a dubious way), doesn’t mean that every sport has the right or ability to do the same. In cycling they „professionalised“ the whole sport when the american money came in so now you need a lot of money to even run a team. Then came the millionaires, who had a team as a plaything (for example tinkoff, sky and bahrain merida etc.) inflated the whole salary structure, so that now even midfieldriders get a lot of money. Money which simply is not in the sport. Even ASO make no money from all their other races than the Tour de France. They put money from the Tour in the Dauphine to keep it alive. It often seems like the teams are unable to see the reality. Or maybe they prefer not to.